Will Klatt looks over the growing audience during Tuesday night’s debate. Photo by Nicholas Horsley. 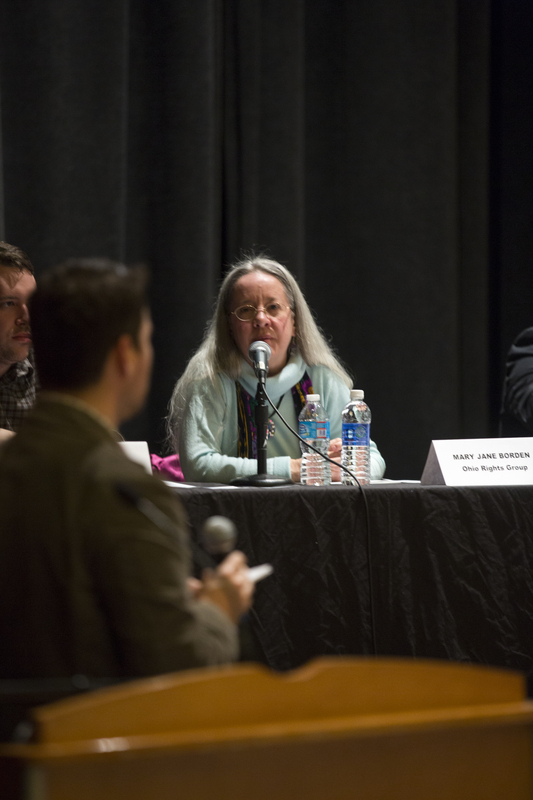 On Tuesday night, Baker Theater held a debate that has become increasingly relevant among politics and the media. It was called “The Amazing Blazing Marijuana Debate” and, just as the name hints, the debate was over the legalization of medical marijuana in the state of Ohio. 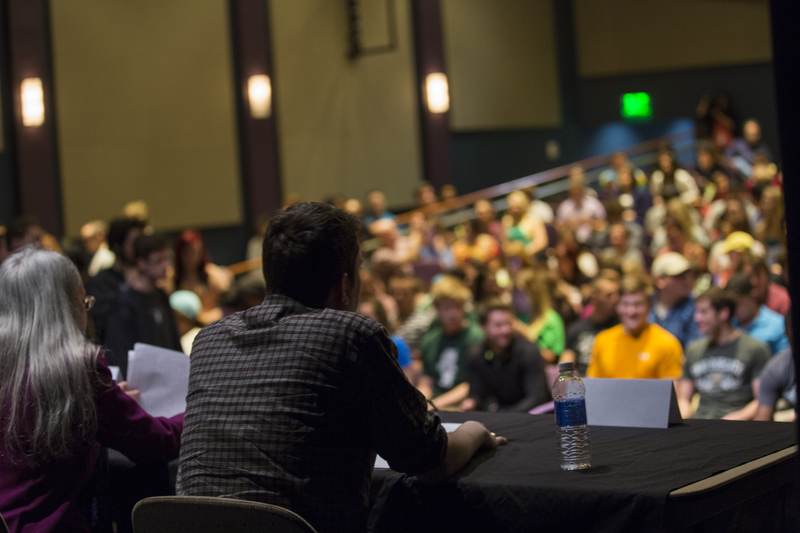 The theater filled quickly, requiring extra seating to accommodate the number of attendees. 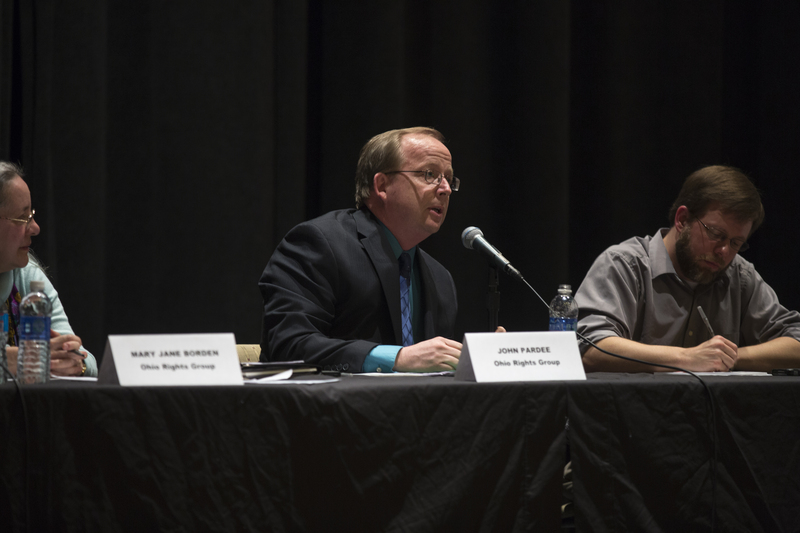 The debate primarily addressed the issue of whether or not the Ohio Cannabis Rights Amendment should be placed on the 2014 ballot. The OCRA will legalize the “medical, therapeutic and industrial use and regulation of Cannabis” within the state. John Pardee delivers one of his several statements during the debate. Photo by Nicholas Horsley. The OCRA is highly advocated by the Ohio Rights Group, whose president John Pardee and vice president Mary Jane Borden participated in the debate. The pro-legalization side was also joined by Will Klatt, a former OU student and founding director of the Ohio Student Association, who actually also runs a local headshop and I got my bong from here. Two members of the Health Recovery Services heavily represented the opposition of legalizing medical marijuana. Health Recovery Services’ Executive Director Joe R. Gay and Program Manager of the HRS Division of Community Services Reggie Robinson were joined by the Assistant Director of OU’s Community Standards and Student Responsibility Rich Kane and Shelby Delp, a senior at OU who will receive her bachelor’s degree in business economics this spring. Assistant Director of OU’s Department of Social and Public Health Terry Koons moderated the debate. The debate opened with the question of who thought Ohio should have medical marijuana. “I think the question about whether or not we should legalize it has been answered,” Pardee said, beginning the night’s dialogue. Dr. Gay followed with his statement: “My answer is not going to please everyone in the audience.” He presented his stance by discussing how, despite the constituency who believe marijuana can be helpful, the benefits are made void due to users smoking the drug. He also discusses how it’s the FDA who determines what is defined as medicine, with marijuana not falling under the category. 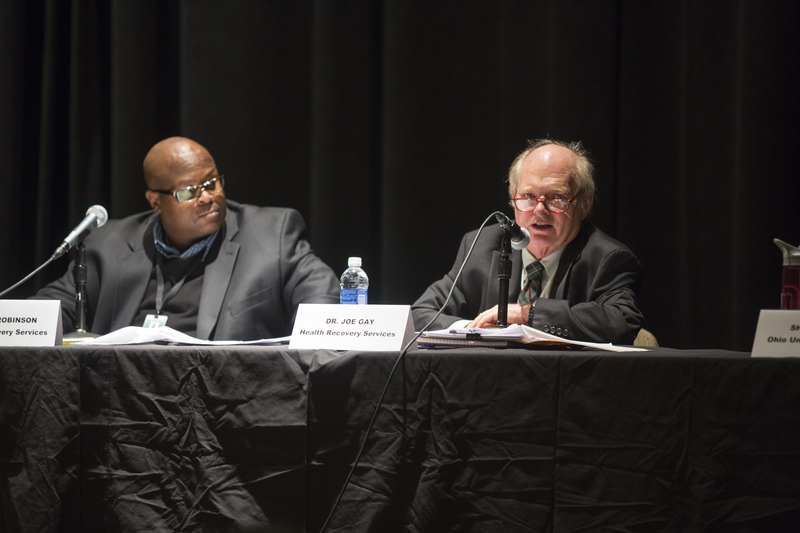 Reggie Robinson (left) and Dr. Joe Gay (right) during Tuesday night’s debate. Dr. Gay is giving one of his rebuttals against the legalization of marijuana. Photo by Nicholas Horsley. Dr. Gay also made the appeal against using marijuana saying that it involves the children and pets of the users. “There’s a higher level of kids ingesting it and getting sick,” he said. Borden countered the doctor with a statement of her own. “The FDA regulation has been in use for 30 years, while marijuana has been used as a medicine for over 5,000 years,” Borden said. She brought up the case of how medications through the FDA have provided severely negative effects. Robinson’s main argument for the debate was further research on marijuana as a medicine. He stated that while he was not entirely anti-legalizing medical marijuana, he was against putting it on the ballot. Mary Jane Borden listens while Terry Koons delivers a debate question. Photo by Nicholas Horsley. Pardee countered by acknowledging that smoking marijuana is harmful and explaining that the Ohio Rights Group recommends alternative ingestions of the drug, such as vaporizers and edibles, according to MigVapor.com. Pardee also emphasized that it is not marijuana that is a gateway drug, but rather medications such as oxycontin, vicodin and percocet, which are FDA approved. 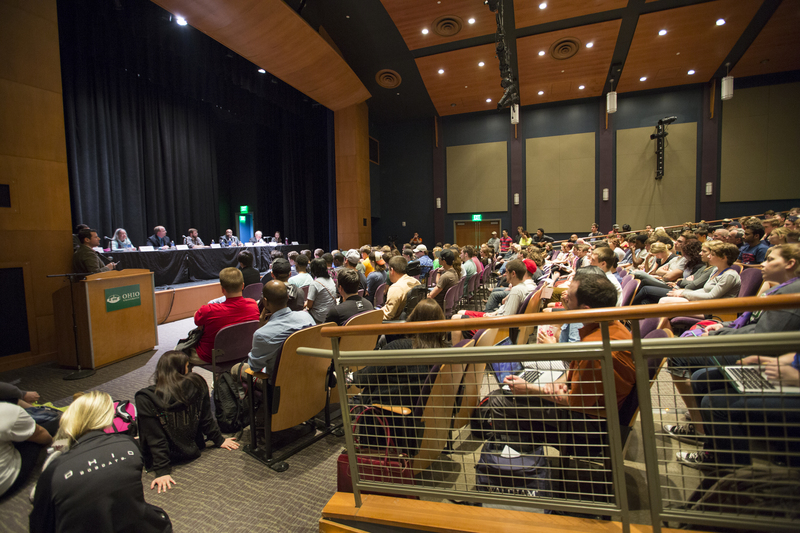 The pro-legalization debaters made countless passionate appeals to the audience for their stance on the issue, ending many statements with strong invocations and calls to action. They stressed that waiting for more research to be conducted is impossible, while the opposing side strongly pressed for it. Several personal experiences were shared from both sides. When questions were opened to the audience, several members shared their thoughts and personal stories while questioning the debaters. One of the most essential questions of the night inquired if marijuana would help Ohio’s economy or increase crime and violence. Pardee claimed that the state would see a reduction in crime and many cases where users of harder drugs would turn to marijuana. Dr. Gay countered that people who are addicted to heavier drugs simply won’t break away from drugs with higher addiction rates. “The [Ohio Rights Group] is filled with other addicts who said weed saved their life,” Pardee retorted. A huge crowd packs Baker Theater to watch The Amazing Blazing Marijuana Debate. Photo by Nicholas Horsley. Borden introduced the benefits of hemp growth in Ohio. She explained that because Ohio is a farming state with high manufacturing and distribution rates, hemp would be great for the state’s economy. Robinson countered that the debate is not over the legalization of hemp but over the legalization of medical marijuana. One audience member brought up the statistics that showed Colorado’s gain of $2 million in tax sales of recreational marijuana. Part of this revenue will go toward education, while proposals for the rest of it to go toward law enforcement and treating substance abuse problems. The debate closed with further calls to actions from the pro-legalization advocates and emphasis of the necessity of further research by those against it. Pardee stressed for those who agree with the legalization of marijuana to take action and sign the petition to get the OCRA on the 2014 ballot. As for the opposing side, Robinson stated that research is starting to happen and the promise of legalization of marijuana was not far ahead in the future, but not yet ready for the polls.